There was this one summer where we kept going to the same beach every other week or so. It was a little cove tucked away from the majority of the beachgoing population, vendors would follow us there, selling us cold beer and letting us rent their giant parasols. The water was clear and warm, and all of the negative stuff I usually associate with going to the beach simply wasn’t an issue here. The way that the cove was set up for some reason protected our little spot from any serious waves. And so I could go out and swim, fill my lungs up with air and bob up and down, relax, look up at the endless sky and forget that I was in the ocean. Way out in the distance there was this one buoy, and whenever I went for a dip, it called out to me. Could I make it out there? I’m not a bad swimmer, but there’s no way I could justify labeling myself anything above amateur. Aside from the swimming lessons when I was a little kid, there was little in the way of any formal aquatic education. Still, I could maintain a doggy paddle for a long time. I’d hang out in the deep section, just past where my feet could reach the sand, and I never felt like I was in any particular danger. Every time I went in, I had the urge to swim all the way out to that buoy. And it was this huge mental game. I thought I could do it, but I’d never really attempted anything so big. And sure, it’s just a swim, but there’s no room for any error at all. If something unexpected were to happen, a cramp, a shark, a missile strike, I’d be gone, that would be it. And I always think about people flocking to the beach. You look at the earth from above, those eternal oceans comprising the vast majority of the planet. And here we are, these little ants doing our best every day just not to get annihilated on dry land. Let’s take a swim in the water. Let’s dip our feet in the very beginnings of a vast body of water that could at any time extinguish us from existence. Still, the call to this particular buoy simultaneously terrified me yet pulled me out. Each trip to the beach I’d wade out just a little bit, trying to get myself just to make a decision, trapped in the space in between heading out or falling back. One day I decided to go for it. Nice and easy, I used my elementary breaststroke to keep my head down and swim straight out. I didn’t want to freak myself out, so I decided not to look for a while, just to concentrate on doing what I was doing. After what I assumed had to have been at least ten or fifteen minutes, I raised my head to the horizon, hoping that my destination wouldn’t be that much further away. But as I wiped the water away from my eyes, it looked like I hadn’t made any progress at all. Worse, when I turned around to look back, the shore looked ever farther away than what I had originally estimated the distance would have been from beach to buoy. I started freaking out a little, realizing that maybe I had bitten off a little more of the ocean than I was prepared to swallow. My body was doing OK, I mean, I was tired, but not on the verge of collapse or anything. Still, my mind imagined what that collapse would feel like, and how much longer I’d have until that fatigue became an inevitability. My breathing picked up, I was starting to panic. Not really sure if it would have been shorter to the buoy or back, I wound up settling on the buoy. I calmed myself down as best I could and concentrated on my stroke, slowly, steadily. And yeah, I finally got there. The buoy was huge, which I think gave me the impression that it was a lot closer to land. There wasn’t really anything to grab onto, and the whole surface was covered in this thick layer of barnacle or whatever that stuff is that accumulates on objects that spend their lives floating in the ocean. I rested. 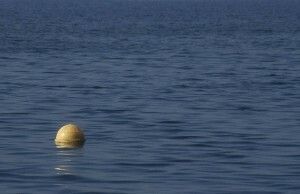 I bobbed up and down with the buoy. I waved to everybody back on the sand, not even sure if they could see me, or if they’d been paying attention to my swim at all. I was reluctant to let go, seeing as how I’d definitely be more tired going back, and the prospect of another mini panic attack was still a very fresh fear. But I floated on my back and only moved my arms enough to propel me in the general direction of the back. It took longer than it did to come out, but when I finally got to the point where I could reach my feet to the ocean floor while at the same time keeping my head above water, I finally let my muscles relax, and yeah, I was pretty beat. I have no idea how much longer I could have remained moving, but it takes work to keep yourself afloat. I think about when I started freaking out, how I got a very real feeling that I was in some serious trouble, and body’s response to that danger served as the one thing I couldn’t afford to do to keep myself from sinking. Looking back, it’s a cool story, but only to me. 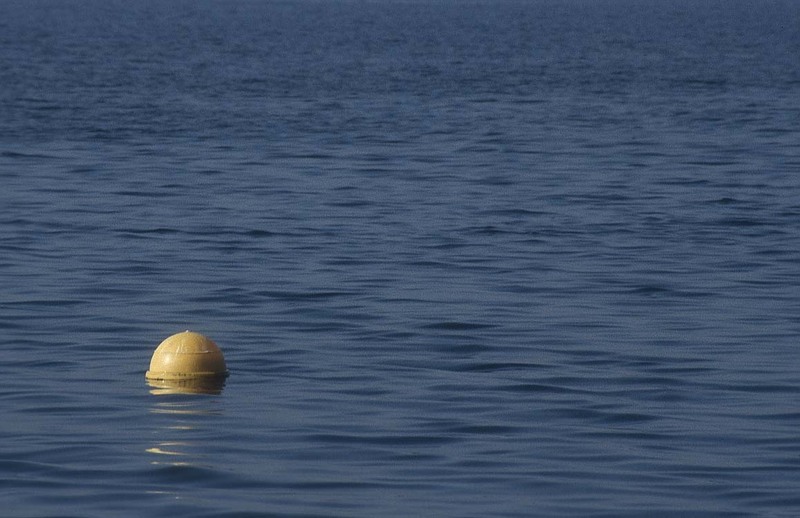 I try to tell people whenever I’m at the beach about this one time that I swam to a buoy. But I can never really capture the excitement. Swimming out and swimming back I guess isn’t that big of a deal. This entry was posted in Uncategorized and tagged buoy, float, freak out, ocean, swim on June 30, 2014 by Rob G..